Submitting your account and payment information is required in order to receive prompt payment for your ticket sales following your event's completion. Within one week after the event has ended, we will pay you for all of your ticket sales. Checks are sent out via express delivery (usually FedEx) to the name and address designated on your account’s Payment page. You must fill out the Payment page before we can send a check, and we remind all event organizers of this through our regular event confirmation emails. It is possible to create, publish, and run events without having filled out the Payment page, but we strongly recommend that you do complete the form as early as possible to ensure the speedy delivery of your payment. 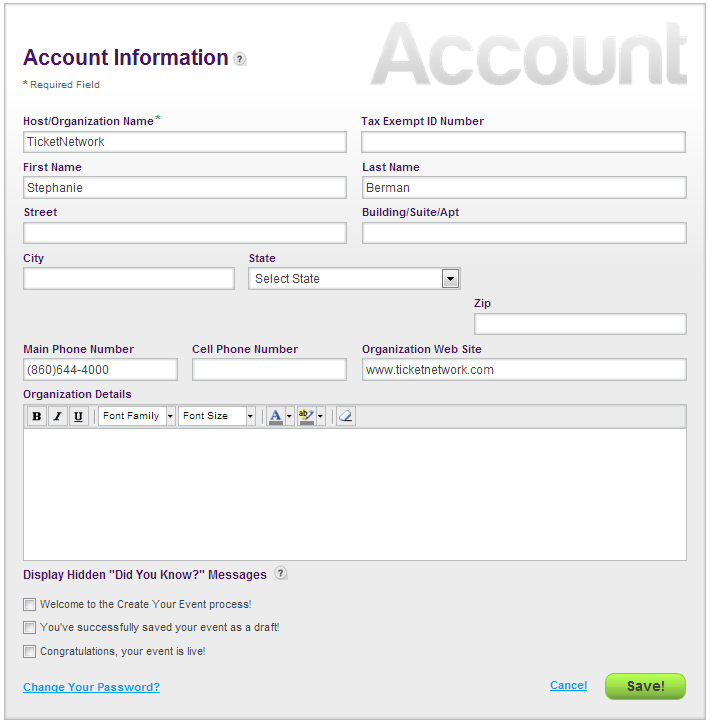 To access the Account page, log in to ezEvent® and click the Account link at the top of the page. The purpose of the Account page is to collect information about you (the event organizer) and your organization. The data you enter on this page is the default information that will display in the Who section (Host/Organization Information) of the Create Event page. This information can be edited at any time. If you created an event before you filled out the information on the Account page, you will find that everything you initially entered in the Who section of the Create Event page has been transferred to the Account page. Your data will only transfer if the Account page is blank. This means that once the information fields on the Account page have been saved, they subsequently will not be updated with information as you create new events. The information you save on the Account page will be used as a default setting in the Who section (Host/Organization Information) for every new event you create. Again, this information can be edited at any time and you are able to make appropriate changes as you Create and Edit each individual event. On the Account page you can also change your password if necessary. Click the Change Your Password link at the bottom of the page. You will be prompted to enter your Old Password, and then submit and re-enter a New Password. 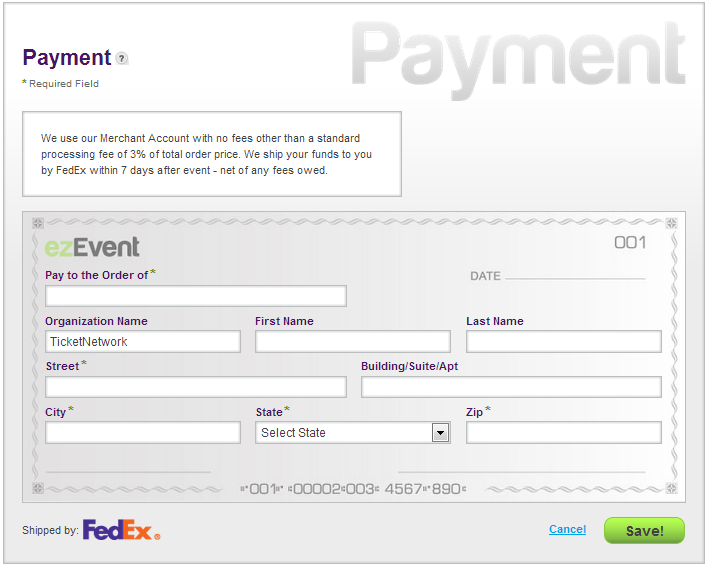 To access the Payment page, log in to ezEvent® and click the Account link at the top of the page. From the Account page, click the Payment button on the menu bar. The purpose of the Payment page is to collect all of the information necessary for ezEvent® to process the payment for your ticket sales. The Payment information form is designed to look like a check. Not every field is required, but filling out the entire form is encouraged. The most import field to complete is the “Pay to the Order of” field, which is the first field on the page. In this field, you should enter in the name listed on the account that you will be submitting the payment to. This can be an individual bank account, an organization’s bank account, or any other entity that you would like to designate as the recipient of the proceeds from your event. The remaining fields let us know where to mail your payment. Entering the recipient's name and full address ensures that the check will mail directly and without delay. When all of your information is entered correctly, click the green Save! button. ezEvent® charges an 89¢ fee per paid ticket sold, plus a 3% credit card processing fee. Free events that do not collect money for anything and are free to the public are not charged a per ticket fee. Free events that are not open to the public will be charged a $0.35 fee per ticket. Your funds will be sent out through FedEx within 7 days of your event - net of any fees owed. ezEvent® will send you an invoice that includes a full breakdown of each transaction.